iNeibo-Your neighbor, your home helper! 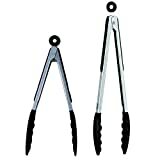 What you will benefit from iNeibo Kitchen Tongs? Washing instruction: Wash it with warm soapy water before first use. Don’t clean it with abrasive soap or scouring pad, hand-wash recommend.